Originally published under the title "Erdoğan's Despotic Slide in Turkey is Bad News for Europe." 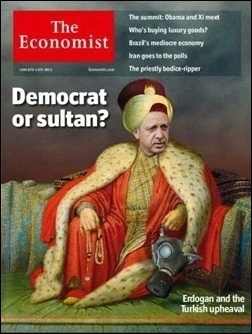 A rhetorical question by the time the Economist ran this cover in June 2013. The Republic of Turkey, long a democratizing Muslim country solidly in the Western camp, now finds itself internally racked and at the center of two external crises, the civil war in next-door Syria and the illegal immigration that is changing European politics. The prospects for Turkey and its neighbors are worrisome, if not ominous. The key development was the coming to power of Recep Tayyip Erdoğan in 2002, when a fluke election outcome gave him total control of the government, which he then brilliantly parlayed into a personal dominion. After years of restraint and modesty, his real personality – grandiloquent, Islamist, and aggressive – came out. Now, he seeks to rule as a despot, an ambition that causes his country incessant, avoidable problems. Initially, Erdoğan's disciplined approach to finance permitted the Turkish economy to achieve China-like economic growth and won him increasing electoral support while making Ankara a new player in regional affairs. After years of restraint, the real Erdoğan – grandiloquent, Islamist, and aggressive – came out. But then conspiracy theories, corruption, short-sightedness, and incompetence cut into the growth, making Turkey economically vulnerable. Initially, Erdoğan took unprecedented steps to resolve his country's Kurdish problem, acknowledging that this ethnic minority making up roughly 20 percent of the country's population has its own culture and allowing it to express itself in its own language. But then, for electoral reasons, he abruptly reversed himself last year, resulting in a more-than-ever determined and violent Kurdish insurgency, to the point that civil war has become a real prospect. Initially, Erdoğan accepted the traditional autonomy of the major institutions in Turkish life – law courts, the military, the press, banks, schools. 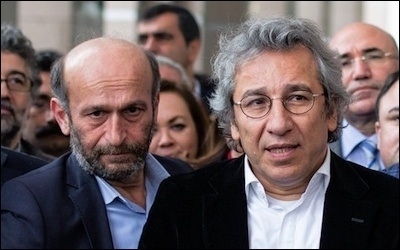 Cumhuriyet editor-in-chief Can Dündar (right) and journalist Erdem Gül (left) were jailed on charges of terrorism and espionage when they exposed Erdoğan's covert support for ISIS. No longer; now he seeks to control everything. Take the case of two prominent journalists, Can Dündar and Erdem Gül: because their newspaper, Cumhuriyet, exposed the Turkish government's clandestine support for the Islamic State (ISIS), Erdoğan had them imprisoned on the surreal charges of espionage and terrorism. Worse, when the Constitutional Court (Turkey's highest) reversed this sentence, Erdoğan accused the court of ruling "against the country and its people" and indicated he would ignore its decision. Initially, Erdoğan maintained cautious and correct relations with Moscow, benefiting economically and using Russia as a balance against the United States. But since the reckless Turkish shoot-down of a Russian warplane last November, followed by a defiant lack of apology, the little bully (Erdoğan) has more than met his match with the big bully (Russia's Vladimir Putin) and Turkey is paying the price. French President François Hollande has publicly warned of "a risk of war" between Turkey and Russia. Initially, Erdoğan's accommodating policies translated into a calming of domestic politics; now, his bellicosity has led to a string of minor and major acts of violence. To make matters worse, many of them are murky in origin and purpose, building paranoia. For example, before the Kurdish group TAK claimed responsibility for the bombing on Mar. 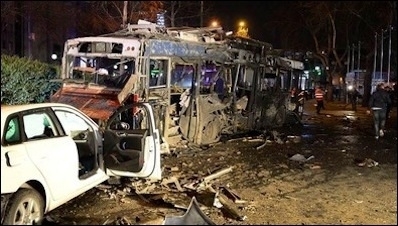 13 that killed 37 near the prime minister's office in Ankara, the attack was variously blamed on Kurds, ISIS, and the Turkish government; . It was interpreted as intending to justify a more forceful campaign against domestic Kurds or to punish the government for attacking the Kurds; to encourage a Turkish military invasion of Syria or to frame Erdoğan's political archenemy, the Gülen movement. The scene in Ankara on March 13. Initially, Turkey became a plausible candidate for membership in the European Union thanks to Erdoğan's muted behavior. 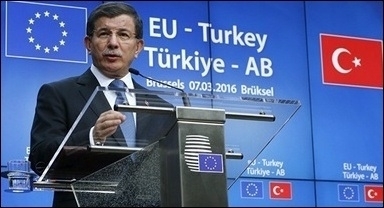 Now, his slide toward despotism and Islamism means the Europeans go merely through the motions of pretending to negotiate with Ankara, while counting on the Republic of Cyprus to blackball its application; as Turkish journalist Burak Bekdil notes, "modern Turkey has never been this galactically distant from the core values enshrined by the European civilization and its institutions." In the early months of the Syrian uprising, Erdoğan offered sage advice to the dictator in Damascus, Bashar al-Assad, about relaxing his grip and allowing political participation. Things have gone so awry that – as Dündar and Gül reported – Erdoğan now supports ISIS, the most fanatical and Islamist organization of today, and perhaps ever. That support has taken many forms: permitting foreigners to cross Turkey to reach Syria, allowing recruitment in Turkey, providing medical care, and provisioning money and arms. Despite this, ISIS, fearful of betrayal by Ankara, threatens and attacks Turks. Erdoğan's error of backing ISIS and other Sunni Islamist organizations in Syria has hurt him in another way, leading to a massive influx of Syrian refugees to Turkey, where, increasingly unwelcomed by the indigenous population, they cause new social and economic strains. Which brings us to Erdoğan's latest gambit. The many Syrian refugees wanting to go on to northwestern Europe provide him with a handy mechanism to blackmail the European Union: pay me huge amounts of money (€6 billion at latest count) and permit 80 million Turks to travel visa-free to your countries, or I will dump more unwelcome Syrians, Iraqis, Afghans, Somalis, et al. on you. So far, the ploy has worked. Led by Germany's Chancellor Angela Merkel, the Europeans are succumbing to Erdoğan's demands. But this may well be a Pyrrhic victory, hurting Erdoğan's long-term interests. In the first place, forcing Europeans to pretend they are not being blackmailed and to welcome Turkey with clenched teeth, creates a foul mood, further reducing, if not killing off, Turkish chances for membership. Second, Erdoğan's game has prompted a profound and probably lasting shift in mood in Europe against accepting more immigrants from the Middle East – including Turks – as demonstrated by the poor showing of Merkel's party in elections earlier this month. This is just the start. In combination, these errors by Erdoğan point to more crises ahead. Gökhan Bacik, a professor at Ipek University in Ankara, notes that "Turkey is facing a multifaceted catastrophe," the scale of which "is beyond Turkey's capacity for digestion." If Iran is today the Middle East's greatest danger, Turkey is tomorrow's.